Fiat's Russia deal: 150,000 Jeeps a year? Chrysler may build the next-generation Jeep Grand Cherokee in Russia. This concept was shown at the 2009 New York auto show. TURIN -- A Fiat joint venture plant in Russia will build 150,000 Jeeps per year, says the venture's Russian partner. But Fiat and Chrysler aren't commenting. On Feb. 11, Fiat S.p.A. signed a deal to expand its joint venture with Sollers to build as many as 500,000 vehicles a year by 2016. Fiat owns 20 percent of Chrysler Group. Nikolai Sobolev, a Sollers vice president, was quoted by the Russian business newspaper Vedemosti as saying the venture will build about 150,000 Jeeps a year. Chrysler declined to comment. A Fiat spokesman here said the Fiat-Sollers plan is a work in progress. The spokesman confirmed that the joint venture plans to build nine models, of which four will be SUVs. 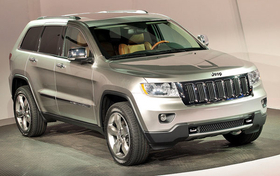 Said Fiat and Chrysler CEO Sergio Marchionne: "Jeep is Chrysler's only brand which makes sense in the Russian market." Russia's muddy roads are ideal for all-wheel and four-wheel drive. David Herman, former chairman of Adam Opel AG, is chairman of Sollers. People familiar with the matter say the Fiat-Sollers joint venture could begin assembling completely knockdown kits of the current Jeep Patriot, Liberty, Wrangler and Grand Cherokee as soon as the end of the year. This kit assembly would help increase Jeep brand awareness in Russia before production is fully localized. The successors to the Patriot and Liberty would be the first Jeep models fully localized in Russia, sources said. These two new models, both due in the United States in 2013, will be based on the Compact Wide architecture that Fiat and Chrysler are developing.